July’s construction PMI index rose to 50.9, up from June’s 48.2, but all the credit goes to the commercial sector! 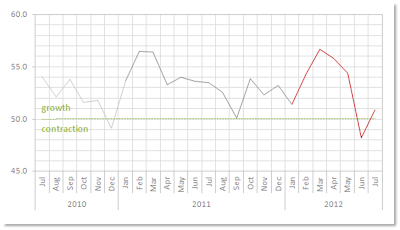 Economists had predicted another month of doom and gloom, estimating a PMI of 48.0 last month – but not us! We simply based our prediction on the fact that June was so bad, there had to be growth and the chief executive of the CIPS, David Noble, agreed. As with the previous month, the commercial sector demonstrated further growth, however both the civil engineering and house building sectors continued to contract. Some good news though, employment in the sector grew from 48.9 to a PMI of 51.5! The report also shows that companies are feeling more optimistic about business prospects this month. So, what are my predictions for August? In the hope that August is less rainy than July and that the Olympics will work some sort of magic, I think there will be further growth and just to put a number out there, let’s go with 52.3!